A patient rests in a hospital bed by iStock. Nobody wants to die, but we all do at some point. Hospice care will not prevent your death, but can help you during this time at the end of life. If you care for someone with a grave illness, or if you care for an older adult relative, hospice care is an option that can be beneficial to you, your family, and the dying person. There is almost always something that can be done to improve the quality of life for those near death. What can be done may not prolong life, but there is always a valid treatment to bring comfort and dignity. This is a promise that hospice strives to deliver. Hospice is an idea, a philosophy of care. While there are, and historically have been, buildings called hospices, today "hospice care" need not mean care delivered in a special facility. The idea is that if someone you love has an incurable illness, and treatment to prolong life and keep the illness under control no longer works, there is still something that medical professionals can do. Even if life cannot be prolonged, comfort can virtually always be provided, and it should be provided effectively whenever possible. Although hospice is an idea not dependent on a particular place or facility, hospice care is delivered to the patient and the family at a place most often of their choosing. The place is most often the patient's home because that's where most people would like to be in their final months. Sometimes a patient may need a specific type of care that cannot be provided at home or the primary caregiver is too frail or ill to provide care. Then hospice may be delivered somewhere other than the home of the patient. Some hospices have inpatient facilities. These could be freestanding buildings or designated rooms in a hospital or nursing home. When hospice care is provided outside the home, every effort is made to make the place as homelike as possible. Making a hospital room or a nursing home room homelike takes imagination and work. That's why many hospices, if they can get sufficient endowment funding, build freestanding "hospice houses." Some nursing homes and hospitals have separate hospice units that are decorated and staffed different than the rest of the facility. Wherever hospice care is provided for the patient, the family should expect to have 24-hour-a-day access to the patient. Children should be allowed to visit, and within reason, pets should have access to the patient. Hospice care is directed at the entire family, so wherever it's provided, it consists of more than just nursing care and medications for comfort. Spiritual guidance is offered. Spiritual guidance can be independent of religious background. Social work help is available when needed. Volunteers might be with the patient at least for several hours and at least twice a week. The volunteers provide company for the patient while the family caregivers take time to do whatever they need to do to keep up with their other responsibilities and interests. One of the problems with being a primary caregiver for a person who has a terminal illness is that there's a temptation to put your life on hold to such an extent that, when the person dies, you have not taken care of yourself and your other obligations. On top of that is layered grief. Hospice staff do all they can to prevent this from happening. The hospice will evaluate the ill person's medical condition, making note of symptoms including pain and all forms of suffering reported by the patient and family. The person's wishes about death are taken into consideration with a document called an advance directive or living will. The hospice also will evaluate the spiritual status of both the ill person and the family, any financial problems that may prevent appropriate treatment, and any other issues the person or the family might have. The hospice will care for the whole family as a unit. At my hospice, above an old man's bed, where other residents might have placed a crucifix or a favorite family photo, hung a simple frame with a yellowed piece of paper. On the paper, still legible, was a poem. The poem had been written, the old man said, during the long days aboard his troop ship headed for the Pacific islands during WWII. He'd always wanted to put it to music, but allowed as how he "just never got around to it." Now, he knew, he was dying. Both the old man and the poem deserved music. But the hospice served a small rural county; no music therapist here. I copied the poem and published it on the Internet to a music discussion chatroom. "Could someone put it to music?" I asked. Someone could. An email brought me the composed tune. I printed the music out and gave it to a singer in our local community college theater group. She and one of the pianists in the group recorded the song. The old man died. But not before he could hear the music he had started. Often the ill person's symptoms can be improved significantly even though the basic illness cannot be cured. A social worker will assess any issues affecting the ability of the ill person's family to deal with the illness or with any other social problems arising during the illness. Clergy will help the family deal with spiritual issues around death and dying. If necessary, a nutritionist will help the family deal with the fact that the person's appetite gets worse at the end of life. At times, the patient no longer likes the taste of foods that he or she previously loved. The nutritionist may help the family find other foods or recipes that the patient can enjoy. Some hospices also can provide art or music therapy. If the ill person is being cared for at home, hospice will provide nurses and home health aides to help provide care. The hospice will provide volunteers to read to the ill person and provide care while family members go out to do things that need to be done. At times, the ill person could be admitted to an inpatient facility while the family takes a break from providing care. The family may wish to go on a vacation that the patient is no longer strong enough to participate in. Or the family may just need a few days in which they can get uninterrupted sleep at night. This is called respite care and can last up to five days. It's part of the hospice Medicare benefit. Respite care can be provided through an inpatient hospice unit, a hospice house, a nursing home, or an acute care hospital that has dedicated hospice beds. 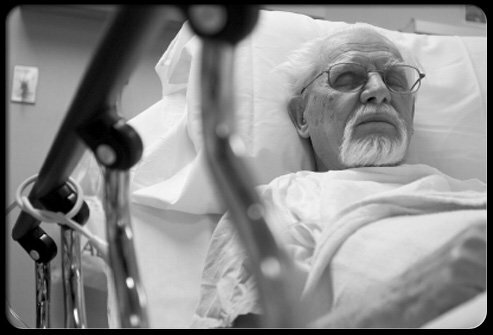 A hospice does not admit a person to an acute care hospital for intensive care. In fact, the concept of hospice is designed with the idea that most people don't want to die in an intensive care unit (ICU) with tubes and wires sticking out of various parts of their bodies. The purpose of an ICU is to save the life of someone who has an illness or an injury that's curable. The ICU is not set up to provide comfort measures, and doctors who frequently practice intensive care medicine often are not well versed in comfort measures. Doctors who specialize in traditional medicine treat people with grave illness aggressively. Palliative care specialists can help the patient and doctors to determine when and if the patient's needs and wishes are being met. Sometimes, active aggressive care is no longer indicated, and hospice care is now more appropriate. Hospice provides comfort measures in ways that most other doctors may never have learned about, but that care does not involve ICU treatment. The interplay between active, cure-oriented patient care providers, palliative care providers, and hospice care providers is increasingly being recognized as being in most patients' best interests when the underlying diagnosis appears to be incurable. As with any other form of medical care, there is a cost. In the case of hospice, the cost is less than intensive hospital care, but hospice costs more than home health nursing care because more services are provided. How much is "covered" depends on what kind of insurance is available. If the patient has Medicare, the government has outlined what is available on the Medicare hospice benefit. All medications related to the terminal illness are paid for. This helps people who need high doses of morphine or other opioid drugs to control the rather intense pain that often accompanies the later stages of cancer, AIDS, and other debilitating diseases. AAHPM. American Academy of Hospice and Palliative Medicine Website. American Academy of Hospice and Palliative Medicine Web site. American Cancer Society. Caring for the Patient with Cancer at Home: A Guide for Patients and Families. aring for the Patient with Cancer at Home: A Guide for Patients and Families. Brooks J. Midlife orphan. In: Facing Life's Changes Now That Your Parents Are Gone. Berkley Publishing Group; 1999. Byock I. Dying Well. Berkley Publishing Group; 1997. GriefNet. GriefNet Homepage. GriefNet Homepage. Halpern J. Helping Your Aging Parents: A Practical Guide for Adult Children. McGraw-Hill Co; 1987. Health Care Financing Administration. Medicare Hospice Benefits. 1999. Kubler-Ross E. Questions and Answers on Death and Dying. Macmillan Publishing Co; 1974. National Hospice and Palliative Care Organization. The National Hospice and Palliative Care Organization Website. The National Hospice and Palliative Care Organization Website. Zimmerman JM. Hospice: Complete Care for the Terminally Ill. Foreword by Dame Cicely Saunders. Urban & Schwarzenberg; 1981.